Gameweek 33 in the Premier League was exceptionally entertaining as always. The race for a place in Europe next season continues to heat up with every single one of the teams from second to seventh claiming victory this weekend. Meanwhile at the other end of the table, all of the bottom 7 incurred defeats. That is except for Sunderland who are already gone and Crystal Palace who secured an impressive draw to drag Bournemouth into the mess. So at both ends of the table the Premier League continues to be unpredictable and so enjoyable. Through all the action of Gameweek 33 there were some standout performers and these are the best eleven of them. This is the Team of the Week! Enjoy! Simon Mignolet has been fantastic two weeks in a row now for Liverpool and is probably even in the best form that he’s been in since his arrival at the club. Mignolet may have only needed to make 3 saves and 1 claim this match, but every single save was absolutely formidable. His positioning was superb and every single shot he faced could have easily ended up in the back of the net if he hadn’t been so strong. His form of late has now called into question why Loris Karius was ever even considered first-choice goalkeeper as he has been absolutely fantastic this month. Rating: 9/10. With Dejan Lovren and Joel Matip in Liverpool’s starting lineup, the Reds are unbeaten in 14 games. This proves once again why Joel Matip and Dejan Lovren are Liverpool’s best centre-back pairing. The Cameroonian has helped to improve the game of the Serb drastically from last season and now with Mignolet starting to show signs of positive form as well, Liverpool’s normally leaky defense now looks a whole lot sturdier. The entire back line for Liverpool was fantastic against West Bromwich Albion, holding out for a 1-0 win, but Joel Matip was the standout of them all. The 25-year old defender was excellent at the back, winning 3 duels in the air, making 3 tackles, 3 interceptions, and 5 clearances to help Liverpool keep that clean sheet. He also had more touches than anyone else on the field with 95 and completed nearly 90% of his passes. Joel Matip has been one of the Premier League’s best defenders this season and if Liverpool are to make reinforcements to their back-line next season, he is not the man that needs to be replaced. Rating: 8.5/10. Leicester City might have given up two second-half goals, but Robert Huth was still absolutely immense for the Foxes and was probably the best defender in the Premier League this weekend. He was just there to see out danger at every single opportunity and was so crucial in organizing and leading that back-line to what very well could have been a simple victory. Neither goal was any fault of his own and at the other end of the field, he scored a goal of his own from a header off of a Christian Fuchs throw-in. Not only did Huth block two goal-bound shots, he also made 11 clearances, more than any other player on the pitch by 5! The 32-year old just put in his best defensive performance of the season and it is a shame that it wasn’t enough to help lead his team to victory. Rating: 9.5/10. On Saturday night, Vincent Kompany showed Manchester City what they’ve been missing all season long when he came up crucially in a 3-0 triumph. The Sky Blues were absolutely dominant against the Saints, and with the big Belgian in defense, Claude Puel’s side never had any attacking options. Kompany blocked 1 shot, won 2 duels in the air and made 3 interceptions against Southampton, helping City walk to their first clean sheet in 7 matches. He also completed 90% of his passes, had 81 touches on the ball and scored a crucial goal that made the game done and dusted at 2-0. Vincent Kompany is absolutely immense for Manchester City when he plays and all those talking about him like his time at the club is done should go back to school because the 31-year old still has the ability to be one of the best defenders in the world. Rating: 8.5/10. Ander Herrera was absolutely outstanding against Chelsea on Sunday, acting as their best and most crucial performer as he has quietly been all season long. Herrera stuck to Hazard like glue, never allowing him any time in possession of the ball and completely dominating over the Belgian, limiting him to just 59 touches. It was the first time all season long that after starting the match, Hazard didn’t complete a single take-on and that is because he virtually had no room to breathe with the Spaniard sticking to his task excellently well. In addition to limiting Hazard to a minuscule amount of touches and dribbles, the defensive midfielder was just a beast defensively, making 3 excellent tackles, 4 interceptions and 4 clearances. Normally a high number of fouls is not necessarily commendable, but in this case Herrera was also pretty crucial at breaking up play in dangerous areas, and with 4 fouls and his high number of defensive actions, played a key role in stopping Hazard, Costa and Pedro from ever getting going. But going the other way Herrera put in an absolute masterclass, coming up with one of the assists of the season early on for Marcus Rashford before scoring himself when his deflected shot sailed over the head of Asmir Begovic. 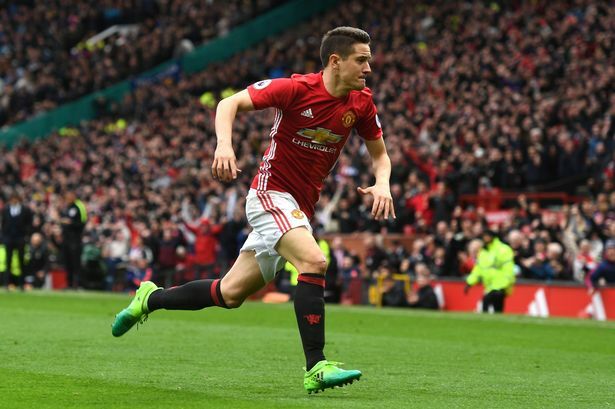 Ander Herrera has been one of the standout performers of this Premier League season and although Zlatan Ibrahimovic is the man winning all the plaudits at Manchester United, this man has been even better. Rating: 10/10. Ross Barkley has been essential for Everton since the start of the year and continues to be their key midfielder as they look for a place in Europe next season. The game was 0-0 at half-time but once Ross Barkley came alive, the game did so as well and the Toffees took the game by a score of 3-1. Pivotal to everything they accomplished in attack, Barkley assisted Ben Mee’s own-goal and created 4 other chances, ripping Burnley’s defense apart from the wing. The Englishman also had 7 shots, won three take-on’s and was fouled three times, as Burnley never got a grip of his skill on and off the ball. He was just everywhere on Saturday, accumulating a stuttering 97 touches on the ball, and even making 3 goal-saving clearances off the line. Without Ross Barkley, Everton might not have even won this match and now after claiming victory they are in a good position to claim a top six finish. Rating: 9.5/10. Although he hasn’t chipped in with quite as many goals or come up with quite as many stellar displays in 2016-17 as he did in his first season in Manchester, Kevin de Bruyne has still been crucial to Pep Guardiola’s side. The Belgian play-maker has more assists than anyone else in the Premier League and in adding two more against Southampton at the weekend in a 3-0 win, now takes his tally up to 13. De Bruyne has at times almost even started to get some of the Mesut Ozil criticism this season, with people saying that he doesn’t work hard enough or fades out of big games But that just isn’t the case. For one, he’s made a tackle and a half per game, that’s more than Gary Cahill for example, and for another, he’s always involved in everything City produce when they go on the attack. So any criticism he’s been given this season minus his goal-scoring touch not quite being up to par is completely unjustified. At the weekend he was brilliant against Southampton, making 5 tackles, delivering 12 crosses, creating 4 chances and assisting two goals to help lead the Sky Blues to a 3-0 win. Rating: 10/10. Heung-Min Son might be the the best player in the Premier League who has been forced to spend so much time on the bench this season. Whenever he is given his chance to shine, he sparkles in Tottenham’s side with his fantastic all-around game. Heung Min Son was dazzling against Bournemouth; creating 4 chances for his teammates to score as well as finding the back net on one occasion himself. He completed 90% of his passes, had 3 out of 5 shots on target, and delivered 3 crosses; acting as a constant thorn in Bournemouth’s thigh on route to a 4-0 win. Heung-Min Son has just been so crucial to Tottenham Hotspur in the past few weeks as Mauricio Pochettino’s side continues to chase down Chelsea. Rating: 9.5/10. In the absence of Sadio Mane, Roberto Firmino has now officially become Liverpool’s key game changer. The Brazilian forward came up crucial off the bench against Stoke last weekend and did it for the Reds again, leading Jurgen Klopp’s side this time to a narrow 1-0 victory. Without Firmino’s goal, Liverpool by no means win this match, but the Brazilian was in the right place at the right time to finish off his best chance of the game as he has been and has done all season long and the Reds were able to claim victory. Beyond his goal, Firmino was just everywhere in attack from a Liverpool perspective, taking 3 shots, completing five take-on’s and most impressively of all, creating 5 chances! He also did his bit in defense with 2 duels won in the air, 2 tackles, 1 interception and 1 clearance and had almost double the amount of touches of Origi and Sturridge combined together. Roberto Firmino really is one of the Premier League’s standout stars and he has perhaps even gone a little bit underrated this season, coming up with vital displays for the Reds time and time again without ever really being talked about in the same breath as the likes of Hazard, Kane, Lukaku, Kante, etc. He’s been Liverpool’s game changer since Sadio Mane got injured and now will be their most crucial player for the remaining five fixtures as they look to finish the season on a high and claim third place. Rating: 10/10. Can anybody stop Harry Kane when he is in this kind of form? The British striker has just been unstoppable all season long and has now joined a very impressive list of strikers that only includes Ruud Van Nistelrooy, Thierry Henry and Alan Shearer. On Saturday against Bournemouth, Kane scored his 20th Premier League goal for the third season in a row, becoming just the fourth player, after the three mentioned above to do so in Premier League in history. Van Nistelrooy was the last to do so before Kane all the way back in 2001-2004, making this a 13 year wait for a striker to have this kind of impact on the league. Kane was brilliant against Bournemouth and just dominated over the Cherries as he scored one and assisted another in a 4-0 win. He could have easily had a hat-trick if his shots had been more vehement; finding the target with 4 of his 5 shots! The man who is still only 23-years old also completed 88% of his passes, made 2 tackles and created 4 chances for his teammates to score, highlighting his fantastic all-around game. Harry Kane is one of the best players in the Premier League and is now back on track to make an attempt to win his second golden boot. Rating: 10/10. If Marcus Rashford had been expected to start this match, it was never in place of Zlatan Ibrahimovic. But Jose Mourinho made the big call to put the 19-year old straight up top in place of the Swedish great, a move that proved to be a game-winning decision. Rashford’s pace, power and energy were just far too much for Chelsea to handle and even his trickery at times got the best out of normally such steady defenders like David Luiz and Gary Cahill. He was just a constant threat all game long, taking 4 shots, creating 1 chance, and completing 4 take-on’s as Chelsea were absolutely destroyed by the Brit’s vibrancy. Rashford also completed 87% of his passes and delivered 6 crosses, highlighting his willingness to never just take up traditional centre forward positions. Marcus Rashford has the potential to become one of England’s greatest players. He just needs more regular playing time and now with a performance like that, it is hard to see Jose Mourinho taking him back out of the lineup anytime soon. Rating: 10/10. Against Chelsea, Herrera frustrated Eden Hazard with his meticulous marking, was so integral to United’s sturdy defense and even had a crucial role to play for Mourinho’s team in attack. With a picture perfect assist and a pretty fortunate goal, Herrera contributed to both of United’s goals at the weekend but also contributed to everything good about the Red Devils in defense, making 3 tackles, 4 interceptions and 4 clearances. Ander Herrera has arguably been Manchester United’s supreme player this season and now deservedly wins his first Player of the Week award of the season! Jose Mourinho just completely stopped Antonio Conte’s Chelsea from playing on Sunday and managed to walk away with a 2-0 win that was far more than just about “parking the bus”. Everyone was probably expecting Conte’s side to just roll over the Red Devils as they did back in that historic 4-0 win in October but instead it was Mourinho who just completely outclassed the Blues this past Sunday. One of the keys to Mourinho’s success against Chelsea was man-marking. Herrera stuck to Hazard like glue and never allowed him a second to even breathe, while Pedro was anonymous thanks to the work from Ashley Young, Kante uncharacteristically lost more battles to Fellaini than he won and Diego Costa’s loose touches were always snatched upon by Bailly and Rojo. His team selection was also absolutely spot. The aforementioned Fellaini brought something for both Matic and Kante to struggle with, while the eyebrow-raising change of Zlatan out and Marcus Rashford in worked to perfection with the Englishman’s pace being far too much to handle for Chelsea’s normally so steady defense. Matching Chelsea’s 3-4-3 formation worked brilliantly as well and Bailly and Rojo brought so much physicality and defensive awareness that Costa hardly ever saw the ball and had to go so deep just to try and get a touch. Meanwhile Young, Pogba, Valencia, Darmian and Lingard all worked tremendously hard in defense to ensure that De Gea didn’t even have a single save to make. This was certainly one of Chelsea’s worst performances of the season, possibly even the worst of the worst. Sure, Conte and the players must be held responsible for taking their foot off the gas but Jose Mourinho’s tactics, in-game management, and squad selection were all perfect on Sunday and he earned himself what is arguably his biggest win as Manchester United boss. So there it is! The Premier League Team of the Week for Gameweek 33! The season is coming to a close with just five matches remaining but suddenly the title race that looked done and dusted for six straight months is now back on. Will Chelsea cling on for dear life and have enough to creep over the finish line or will Tottenham make what would be one of the most impressive comeback victories of all time. It all remains to be seen and The Mastermind cannot wait to cover it all for you right here! See you next time! Check out more Team of the Week articles right here!